Andrew Quilty’s “The Man on The Operating Table” has been named the 2016 Nikon-Walkley Photo of the Year. 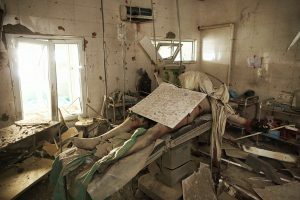 The image was shot by Quilty inside the Médecins Sans Frontières Kunduz Trauma Center in Afghanistan, following the October 3 attack by an American AC-130 gunship on the hospital in which 42 were killed, including MSF staff, patients and patient carers. The image was a clear standout for the judges, an arresting image. Winners will be announced December 2 at the 61st Annual Walkley Awards for Excellence in Journalism. Winners are also announced for two photography prizes. The winners each receive $5,000 worth of Nikon gear. The finalists’ photographs will be toured around the nation in a series of free public exhibitions and are currently on display at the State Library of NSW and the ABC in Brisbane. The Walkleys thank Nikon for its support of the photography awards and prizes. All three films will be screened free for the public at the State Library of NSW on Tuesday October 18 and Wednesday October 19.